Ingericht naar een hoge standaard van de woning is een ideale thuis ver van huis. Deze semi-vrijstaande villa is ideaal gelegen op een centrale locatie in een rustig complex met een gemeenschappelijk zwembad, samen met een kinderbad. Het pand ligt op 100 meter van de dichtstbijzijnde 24 uur Kiosken / mini-markt, en op 200m van taverna's en afhaalmaaltijden. Er is een selectie van restaurants en bars en een bakkerij op Ikarous dat is minder dan 200 meter afstand. Agios Antonious of Bar Street ligt op minder dan 5 minuten lopen, terwijl de kust is een wandeling van 10 minuten. De haven en Graf van de Kings Road zijn ook binnen een wandeling van 15 minuten. De woning heeft een familie badkamer bestaande uit een bad met douche, een beneden toilet en een eigen badkamer met douche in een van de slaapkamers. We stayed in Matthew's house for 5 weeks in Feb/Mar, we found it to be very clean and comfortable, it had everything we needed. The location was perfect within a 15 min walk of everything. The farm shop close by was great for fresh produce at a reasonable price. There are plenty of places to eat and we went to the local pub the Rugby Arms for the weekly quiz and Sunday lunch. Our family came to stay and there was a cot and even a buggy and the small private garden was ideal for our little grandson to play safely in. We would recommend it to anyone. We stayed a week here end of May and had a great time. It is a lovely little property on a small complex. It does face the road (but just go out the back door to the pool). We preferred this as you are away from others. There is a small semi private patio. totally enclosed from the road, plenty of outdoor chairs and sunbeds and a couple of parasols. Actual accommodation is lovely, one room downstairs with sofas, dining table and kitchen which has a washing machine. Up a few stairs to the loo, then carry on up to 2 well sized bedrooms, a bathroom (with shower over the bath) and an en-suite walk in shower room with sink. There is air conditioning, which was needed as it was very hot and all the kitchen utensils you need for a weeks stay. Bonus of good wi-fi connection and English TV. House is actually a short walk down to the beach and harbour but that is good as it is away from all the noise of the late night bars. We had a hire car, and found the location of the house very convenient for visiting other villages and towns. The large supermarket in the Kings Avenue mall has an underground car park, was well stocked and was easy to pop into on the way home. It is indeed only 20 minutes walk from the house to the beach, although ,again, in November it was easy and free to park near the harbour. We also used the local shop just up the road and the restaurant, Pambi's, mentioned by others. The welcome there was warm, the portions large and appetising, and the entertainment cheerful. Of the beaches nearby we really liked the Lighthouse beach and Coral beach. Further afield, Laatchi has good fish restaurants and pleasant sun bathing facilities. In the other direction Pissouri is an attractive beach village . Matthew was quick to respond to queries and provided clear instructions and useful tips.We hope to visit again. I'm really glad that you enjoyed your stay in the house and also ventured outside of Paphos to explore the magnificent surrounding area. Next time you come I will provide more recommendations for you! We did not hire a car, and found that we could walk most to most places within 20 mins, although walking back uphill from the Harbour took slightly longer in the heat. There is a kiosk within 4 mins walk for essential goods, and Pambi's diner another 2 mins walk further for convenient eating, the portions here are huge. There are another 2 Kiosks within 9 and 11 mins walk from the property. Number of different routes to Harbour area, along back roads, via Bar Street, along the main road to the Church, etc. There are numerous eating places along the route to the Harbour as well as along the sea front to suit all tastes and budgets, all portion sizes are large. E-cosi is best for ice cream, directly opposite the bus terminus, extensive flavours a must try. Alkion Restaurant also great eat with set menu & al-a-carte. Number 603 bus route is near to the property either near the Farm Kiosk or Ikarou Street, circular route to the Harbour. Kings Avenue Mall is within 30-35 mins walk if retail therapy required. I would recommend taking a bus into the Old Town from the Harbour as the walk is steep. Buses run from the Harbour into the Water Park and Coral Bay, along with a number of other locations and villages for 1.50 single trip, 2.50 return trip, 5 day ticket, 20 weekly ticket, great value. 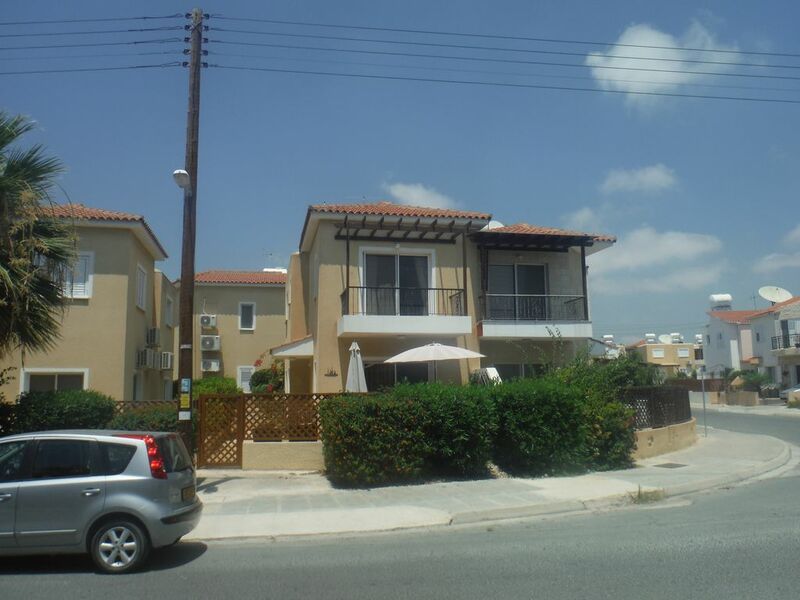 Het huis ligt dicht bij alle voorzieningen en is een korte wandeling naar Paphos stad en de stranden, bars en restaurants.